This popular Slipon style shoe is available in White. 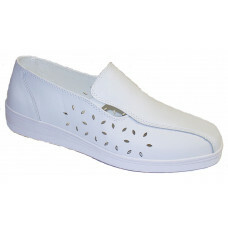 The upper is Leather and PU, is lined and is designed with a slip resistant outer sole. Comfortable memory foam inner sole and to assist with sizing each shoe has a second, removable, insole.